I love shopping at Goodwill. I would definitely do it more if I didn’t have kids, but I love to go look when i get a chance. 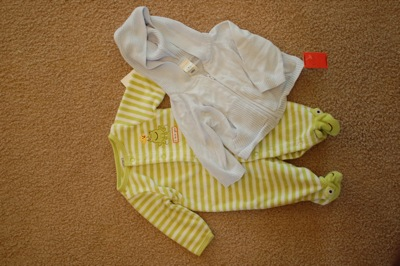 The girls and I went the other day and found all sorts of goodies for our baby boy! I was so excited to get him some cute things at good prices! We found 9 things and spent $17! 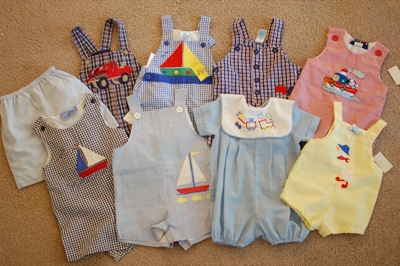 Look how cute these baby boy outfits are! After finding such great things at one store I decided to go to a couple of other stores the next day and see what else we could find. But at 2 stores I only found 2 things worth buying…not as good of a shopping day, that’s for sure! We spent $3, bringing our total up to $20 for 11 items. I got the girls a couple of fun things too, including a princess dress that Belle was super excited to take home. I think Belle has a future in thrift store shopping. She was having so much fun looking through the racks of kids clothes and pulling things out and asking me if it was for a boy or a girl, if it was for a big girl or a little girl, or if it would fit Lucy. And the way she wanted to carry her dress to the checkout and then to the car was precious. I’m glad she thinks its fun! Cute, cute, cute! Teach me your ways, wise thrifty shopper!